Stretched along the southern coast of the Crimea between the Black Sea gulf and the Crimean mountains, Yalta (1479 kilometers away from Moscow) has always been the most popular resort on the peninsula. Clean beaches, 250 sunny days per year, sanatoriums and tons of entertainment options attract about 500,000 tourists annually according to data released by the Crimean Ministry of Resorts and Tourism in August 2015. It drags its little cars slowly to the main viewpoint on top of Darsan Hill. You will see the sea and typical houses, gardens, pavilions and a tower with an old city clock. 2. Travel back 100 years on a time machine of sorts by visiting the summerhouse of famous Russian writer and playwright Anton Chekhov. Thank to the efforts of Chekhov's sister Maria, everything here has been preserved as it was during Chekhov's time. The atmosphere is so authentic that it seems as if the writer will come out of his study and offer you a cup of tea. 3. It is worth conquering the 800 steps on the way to Lastochkino gnezdo (the Swallow's Nest), a viewpoint with a small tower that offers a perfect view of the sea. Its contemporary looks and resemblance to a castle are due to the German oil magnet Baron von Steingel who loved spending his vacations in Crimea. At the beginning of the 20th century he decided to build a romantic castle here similar to constructions one might find on the banks of the Rhine River dating from the Middle Ages. 4. You will see “churchkhela” sellers on practically every corner. Churchkhela is a local dessert that looks like colored bunches of grapes, is made of nuts and is covered with caramelized fruit juice. Try to avoid buying this sweet near sights of interest as you can find it for much cheaper at a market. Experience the atmosphere of an old winery and taste the red port wine Livadia, the semi-sweet Cherny Doktor (Black Doctor) or the white desert wine Sedmoye nebo knyazya Golitsyna (The Seventh Sky of Prince Golitsyn). 6. Buy some yellow cherries and apricots on your way to Vorontsov Palace, where Winston Churchill stayed during the Yalta Conference in 1945. Leading up to the palace there is a park with various corners named for romantic themes: Tea Pavilion, Swan Lake, Sunny Meadow and Meadow of Contrasts. 7. At the palace book a thematic excursion that investigates the secrets of Graf (Russian title equivalent to earl) Mikhail Vorontsov, a Russian government official and hero of the War of 1812. Like many influential figures of his time, he was a Mason, which is why there are secret signs and symbols typical of the design used by the most powerful brotherhood in the world in his residence and the park surrounding it. 8. After visiting the Vorontsov Palace head to Livadia palace, the Yalta summer residence of the royal family of the last Russian emperor Nicholas II. To many this spot is best known for its role as the headquarters of the Yalta Conference in 1945. 9. Climb to the top of Ai-Petri Mountain along the Botkinsky trail specially created for Terrainkur (German term for a health trail) and climate therapy. On the slopes of Ai-Petri check out the Ai-Petri meridian, caves, a weather station and Bedene-Kyr peak. There is a beautiful view of the coast from the plateau up top, which can be reached by automobile or cable car. Unlike most falls, these look best during the torrential rains and melting snows of spring and fall. Its name can be translated as flying water. According to legend a beautiful girl was stolen by a dragon and turned into a stream of water while rapidly flying down the rock. The easiest way to reach the peninsula is by plane. Russian airlines Aeroflot, S7, Donavia and Utair, and the charter airline Vimavia fly there from all three Moscow airports. The planes are often full, therefore it’s best to book your flight in advance, especially if you want a window seat or to sit together with your companion. The flight takes 2.5 hours. Roundtrip fares from Moscow start at 5,500 rubles (about $86). For cheap flights around Russia we recommend using jetradar.com, a travel search engine. 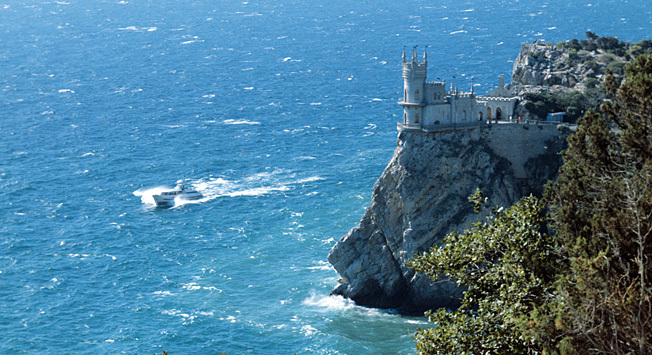 At the moment the only tour company for foreign visitors operating in southern Russia, including Crimea, is Southern Comfort - Tours to the South of Russia. The company employs tour guides that speak English, French, German, Italian, Spanish, Chinese, Japanese and other languages, trustworthy drivers and managers that can organize individual tours based on a client’s wishes. The oldest hotel in Yalta is Bristol. It is not only known for its foreign visitors friendly service, but also for its fast internet connection, a fitness center, a swimming pool and a restaurant.